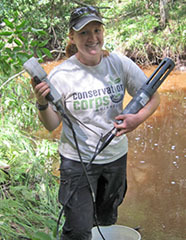 St. Paul, Minn.— If you are like Neva Widner and are considering a career in a conservation field, the 2013 Minnesota Conservation Apprentice Academy may be the place for you. In the summer of 2011, Widner served as a conservation apprentice at the Carlton County Soil and Water Conservation District (SWCD). She performed water quality monitoring and surveyed wetlands, streams and runoff on farms. “The Apprenticeship Academy provided me the opportunity to develop a set of professional skills and network to become competitive in my pursuit of acquiring a conservation position,” said Widner. Her apprentice experience at Carlton SWCD directly led to her to a full-time job as a Water Resources Technician in 2012. As the most experienced conservation leaders are nearing retirement age and walking out the door with the knowledge and experience they’ve built over decades, university graduates are subsequently walking in the door, knowledgeable in theory, research methods and emerging technologies, but lacking practical on-the-job skills important for success. The Board of Water and Soil Resources (BWSR) manages the Minnesota Conservation Apprentice Academy project with funds appropriated through the Minnesota Environment and Natural Resources Trust Fund. The Conservation Corps serves as the employer and uses these funds to match apprentices with mentor SWCDs, provide a monthly apprentice stipend, check in with mentors and apprentices throughout the summer and track long-term results. “The Minnesota Conservation Apprentice Academy allows youth and mentors to work side by side to build a solid foundation for the future management of the state’s natural resources,” said John Jaschke, BWSR Executive Director. Applications for 2013 Conservation Apprentice Academy are being accepted now through March 29. Apprentices will be placed with SWCDs to conduct water quality monitoring, install conservation practices, conduct site inspections, recruit landowners for conservation projects, assist landowners and SWCD staff with management plans, and much more. Applicants must be ages 18-25 and be available to work full-time from May 20 – August 23. Statewide positions are available. Detailed program information can be found at the Conservation Corps website. To the editor: Photo attached, caption -- Widner takes water quality samples during her summer apprenticeship at Carlton SWCD. You are subscribed to Media for Minnesota Board of Water and Soil Resources. This information has recently been updated, and is now available.